Ashitaba: Japan's Tomorrow Leaf is Getting Popular "Today"
It looks like the locals of Japan are on to something big, and they’ve kept it undercover for centuries. Gratefully, the world is now learning Japan’s secret. It’s a magical plant called ashitaba that grows profusely on the rocky shores of several southern Japanese islands. Ashitaba has been harvested for food and medicinal purposes since the 1600s. The hardy perennial blooms from May to October. Ashitaba looks similar to its cousin angelica and even carries the name Angelica Keiskei, and has ribbed stems with a dark green color and long, tapering roots. Increasingly, the miraculous healing nature of ashitaba is raising eyebrows in the health food industry worldwide, as scientific studies emerge on the health benefits of the amazing little plant. Ashitaba has more nutrition than broccoli, cabbage, asparagus, celery, and cucumbers. It hails from the “Apiaceae” family of foods that includes celery, carrots, fennel, parsley, dill, cilantro and cumin. It is said to have a bitter taste at first, but is remarkably similar to celery, and people tend to “develop” a taste for its bitter but nutty flavor. Medical experts suggest that developing a taste for “bitter” is a good thing because “bitter” is one of the healing taste buds we have on our tongue. Angelica keiskei (often mixed up with Gynura Procumbens) is well known throughout Asia and especially in Japan, there have been numerous scientific reports in recent years that confirm its healing properties. Locals have even come to call it the “longevity herb.” Interestingly, Japan has a very high percentage of people who live to be extremely old. Could this simple herb be a reason why? 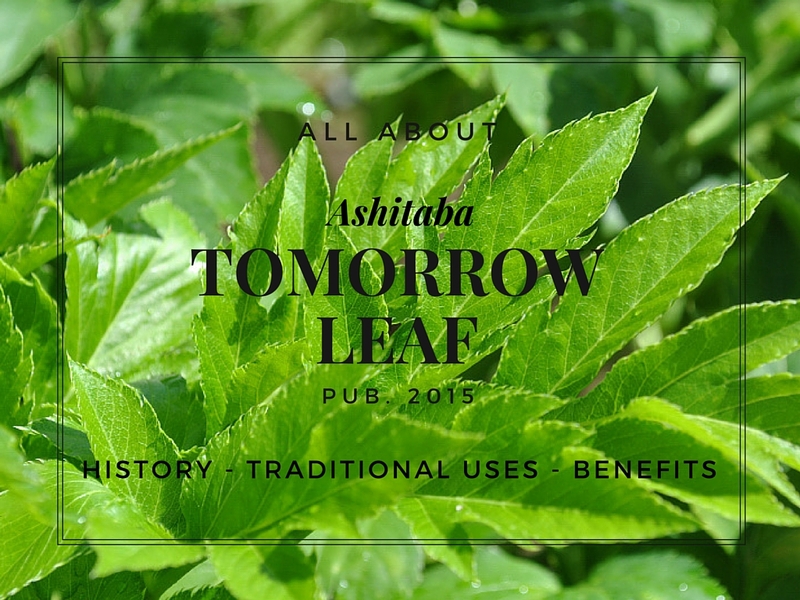 Ashitaba is also called “tomorrow’s leaf” because when it is clipped from the Japanese soil, a shiny new bud pops up its head— overnight! When harvested, it oozes a thick golden liquid that is full of the healing properties so beloved by the Japanese. Some producers in Japan and other Asian countries are now harvesting the nutrient-dense sap to produce “super food” beverages. Local residents are known to harvest the leaves and stems, and dry them to use as tea, or to make a healthy tincture. Even cows benefit when grazing in pastures rich in ashitaba and it is said to improve the quality of their milk. When used topically, it speeds wound healing and prevents infections. Ashitaba can even be applied topically to aid in healing unsightly skin blemishes. Simply buy the dried herb, mix a half teaspoon into purified water and dab onto skin. Leave on for 15-20 minutes. Because of ashitaba’s reported health benefits, it is being studied worldwide. In one such study, research is being done on nerve growth factor— a protein that is important in the development and survival of nerve cells, pain transmittal, temperature control and touch sensations. Other research is focusing on its impact on certain cancers, menopause, and various other disease conditions. Historically, folk medicine claims that ashitaba can be used both internally and externally to heal, restore and provide a long and healthy life. It is a great antiviral and antibacterial healing herb, and frequently used to treat colds, flues, and for other infections. Benefits include usefulness as a diuretic (a substance that causes the body to release excessive water), a tonic (a food or medicine that restores health), and as an aid to improve digestion. The Japanese even suggest that in the past, it provided “stamina, strength and prolonged life” for those working in compulsory labor. Ashitaba is a rich source of phytochemicals— compounds that occur naturally in plants (phyto means “plant” in Greek). The golden, oozing sap is extremely rich in specific phytochemicals called “chalcones.” Chalcones are reported to provide numerous health benefits. In a study reported in 2012 in the publication Science Direct, researchers demonstrated that there was an improved uptake of glucose in the adipose tissue (fat) which could be beneficial to diabetics. Diabetes is a problem of glucose regulation in the body. The chalcones in ashitaba also contain high amounts of vitamins A, B, C, E and carotene. Further, the plant is rich in iron (great for anemia), calcium for strong bones, potassium (reduces unwanted water retention), and improves heart health. If that’s not enough, ashitaba provides fiber for production of Probiotics (good bacteria needed in the intestines), proteins to build strong muscles and chlorophyll for healing. Simply said, the chalcones in ashitaba are all amazingly powerful antioxidants. And, there are no known side effects of any kind. In another study that was conducted in 2010 and reported in the Journal of Medicinal Foods, ashitaba was shown have anti-tumor, anti-oxidant, and anti-diabetic activities. Not only that, ashitaba is reported to be antibacterial, antifungal and anti-inflammatory. Research is currently ongoing around its many healthful benefits that are associated with everything from rapid wound healing to anti-aging cures. To date, the exact mechanisms that cause the anti-inflammatory and other health responses are not completely clear, says HJ Lee and associates, at the College of Oriental Medicine at Kyung Hee University, in the Republic of Korea. Yet, they hypothesize that the anti-inflammatory effects by ashitaba are linked to interference that the plant causes with certain cellular pathways that block signals responsible for causing inflammation. Another known health benefit of ashitaba is its high concentration of vitamin B12. Vitamin B12— currently a “love child” of TV ads and popular on internet buzz— is required by the body for energy, concentration, memory and mood. Often, the digestive system is not able to absorb this vitamin very well, particularly if a person has pernicious anemia, celiac disease, Crohn’s disease, bacterial overgrowth in the small intestine or has parasites. People with these conditions require vitamin B12 supplementation and ashitaba is an excellent source. Heavy drinkers and smokers, pregnant and breast-feeding women, and the elderly may also require extra vitamin B12, and this incredible “super food” is an excellent source. B-12 is also needed for healthy nerves and red blood cells. Vegetarians can become B-12 deficient because it is found only in liver, meat, eggs, milk, cheese and some varieties of fish. Ashitaba is one of the few plants known to contain substantial levels of B12. In addition, it has sizeable amounts of B6 that is utilized in the body for sleeping patterns and improved moods. It is rare to find these B vitamins in a plant. The ashitaba leaf and stem offer an excellent, bio-available, whole-food source of B vitamins and provides an excellent source for those who do not eat meat. Check out this article for more information and scientific research of Ashitaba benefits. As with all tonic herbs, ashitaba is most effectively taken in small, regular doses over a lifetime. You can mix a teaspoon of the powder in water or juice and drink it in the morning. Or blend it into smoothies or just drink as a tea. Some people report mixing it in their salad dressing. As for regional Asian cuisine, the leaves, stems and roots are used in numerous traditional foods like soba (a Japanese noodle made from buckwheat), tempura (Japanese flour) and shochu (a Japanese distilled beverage made from rice). Other foods that ashitaba is frequently found in are various teas concoctions, fruit drinks and beverages, candies and even ice cream. It can be purchased as a powder, in capsules, teas, tablets, and of course the raw leaves are always great if you can find them. 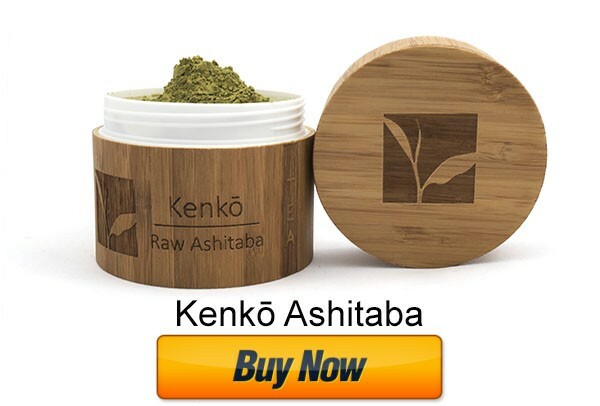 In the United States, you can find ashitaba in Asian markets or look online for packaged ashitaba tea (we recommend the premium Kenko Ashitaba). Domestically, it is becoming in high demand as an herbal tea and supplement. While ashitaba is traditionally used as an herbal medicine, its popularity is growing, and many other forms are being developed. Some farms in Asia are reportedly collecting the sap to make antioxidant super brews. In addition to all the benefits mentioned above, ashitaba contains lots of trace minerals and beta-carotene for boosting the immune system. It is rich in saponins, glycosides and flavonoids, all health-giving compounds that are known disease fighters. And if you tend toward constipation, it has a healthy dose of magnesium which can ease the situation. In a study conducted at Meiji College in Japan, researchers reported that when mice with various kinds of skin and lung cancers were given ashitaba, the cancer stopped growing. And many other studies and reports speak of its many benefits that make it a general and overall healthy tonic. Use it to improve chronic fatigue syndrome, to boost libido and sperm production, for youthful skin, for asthma, and to ease intestinal upsets and acid reflux. It has also been reported to relieve PMS and menopause, help colds and flues, to ease arthritic pain and help with weight loss because it boosts metabolism. Recent studies with mice showed that ashitaba contains compounds that helped with memory, attention and concentration, and enhanced the growth of new nerve cells and nerve rejuvenation. Thus, it may be beneficial to those suffering from Alzheimer’s and dementia. And there are various Asian studies that further say it lowers bad or LDL cholesterol and is great for cardiovascular health. Nutritionally-oriented healthcare practitioners know that one the first steps toward developing disease it becoming too acidic because of a poor diet. Acidity is caused by eating too many meats and rich foods. Using ashitaba on a regular basis is said to switch the body to a more “alkaline” environment. Experts also say that the plant increases the production of growth hormone, known to slow the aging process. If you are looking to grow ashitaba, it is relatively easy to do. It reaches heights of 20 to 30 inches tall and flourishes in lots of hot sunny weather. Make sure the soil is rich and has good drainage. Once the plant has matured, you can harvest the seeds for next year’s planting. Whether growing it yourself or taking advantage of the many commercial varieties available, ashitaba is truly a superfood you can count on to deliver a “one-two punch” to unwanted health conditions. Not many people know about its miracle benefits— yet— but that is changing. Try using ashitaba on a regular basis in foods, tinctures or as an herbal supplement. That way, there is a good chance you’ll be around “tomorrow” to enjoy the amazing health benefits of this remarkably healthy herb! Where can I buy ashitaba seeds and plants? I would like to order.